I've seen a lot of the guys at my local softball field using a lot of "softball brand" gloves. Worth, Miken, Vinci, etc, I've never used one and wanted to know from anyone out there if they're any advantage over a hardball glove. I've been using my baseball glove (PRO88) for SS and the deep pocket works fine, wish it was a little larger (why I picked up a PRO200-4JBT) from Mike, but some of these guys are using 12.5 for infield. I can understand a 13 and maybe a 14 incher for OF, but I'd have control issues using a 12.5 in the infield. I'd have no idea where the ball was if a I were to field a grounder; I'd have to look down to see where it was in my glove. These Worths gloves can cost around $160ish so I'm guessing the quality is decent...? Anyone on here playing softball using one could give me some opinions? I've played mostly SS, and use a Rawlings RBG36 Jose Canseco model. 12.5" glove. (My Dale Murphy disappeared between games last year.) Both were made late '80s - early '90s. Perfect all around size for softball in my opinion. The extra reach and security of a 12.5" glove is well worth the rare occasion I have trouble getting the ball out of the web. Love the way it swallows the ball on an over the shoulder catch. I think once you get comfortable with a bigger glove than you're used to now, you'll wish you had gone bigger sooner. Don't have any experience with other gloves. Softball specific gloves typically have a deeper pocket to house the softball and a shorter profile. Some manufacturers just stretch a 12.5" baseball glove to a 14" softball glove, keeping the pocket the same depth for baseball. The deeper you go on a pocket, the shorter you go in height. Typically, a 12.75" baseball glove will be taller than a 12.75" true softball glove. Vinci is a baseball glove company with high end softball gloves. They(vinci) as a brand have deep pockets throughout their line(baseball and softball). I am not a huge fan of Worth gloves. They do not seem to form well and their leather just bugs me. Soft leather in the palm and stiff leather on the back. Just never have liked them. Had one before I bought my Vinci. I use Vinci, I also rep Vinci. They are one of the best gloves out there. Definitely worth the price tag. I was a customer before I was a rep. In your case, if it works for you, why change it. A slightly larger glove will give you a little more reach and depth. But, if you are comfortable with an 11.5", stay with it. I was using a 11.5" Rawlings HOH GG for the last 22 years and just recently made the swith to a true softball glove in the Vinci PC-2443. It's listed as 12.75" but seems to be more like a 12.5" with a deep pocket. I tried it out in a game before it was ready and it was ok but not great but I saw its' potential. I made a couple of gaffe's due to its' stiffness but it wasn't the gloves fault. I swithched back to my trust Rawlings and all went well the rest of the night. Two weeks later I turned three double plays in a game which could have been 5 if not for bad feeds. The deep pocket I was so worried about is something I am adjusting to. The glove isn't in the neighborhood of being where I want it yet but I know when it's there I will be happy for many years. I still use baseball gloves, Just make sure they are at least 12.25". Mostly I have 12.75" gloves. They seem perfect to me. Anything bigger it still gets lost in there. Still love the TRAP-EZE gloves. Perfect pocket. Baseball gloves. 11.5" A2000 1786 at 2B. 11.75" A2000 L at SS or 3B. 12" A2800 PST at 1B. Seven weeks in, no errors. Softball-sized gloves look and feel so clumsy. Old Hickory Birch C331 34"
Never had a problem using my baseball gloves (12.25"-12.75"), when playing softball. Agree with the softball gloves looking and feeling too big and clumsy........ 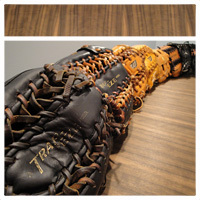 I've seen softball gloves that look like they could double as a gear bag. I use a USA Custom Rawlings PRO T.
12.75, but feels like a 12.5. I use it for infield and outfield. I very much agree with with RedSox81. I started out trying an 11.5" glove for softball infield... then a 11.75"... then a 12" and ended up with 12.25" Big enough but not a cow on your hand. For outfield I also tried a nice 13.5" Glovesmith but it was just to big. I currently use a A2K 1799 (12.5"-12.75"). I find my 12 3/4 inch Trap-Eze web (an OF baseball glove) to be perfect for any softball position. Strong, flexible pocket for outfield play, but a nice deep pocket at the base of the trap that allow for some quicker glovework on the infield. Bigger ball/Bigger glove situation suits me fine.